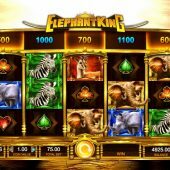 Elephant King slot from IGT is a African wildlife-themed slot, seen many times before with this developer as well as many others. The first one that comes to mind is the excellent slot The Wildlife, but the list goes on and on. Funnily enough the elephant symbols reminded me immediately of WMS’ popular Raging Rhino, but as you will soon learn the two games are very different. Elephant King is lit with the orange glow of dusk over the the Savannah. The game comes with a very enthusiastic soundtrack of wildlife noises accompanied with drum beats and shakers. The big question is though, will this game be up their with other big beasts or will it just form part of the heard? This is classic IGT here, with Elephant King proudly offering 5 reels of 3 rows with 40 paylines in total. Wildlife is the theme here and wildlife is what you get all over these reels. The highest paying is of course the mighty elephant at 500 coins for 5-of-a-kind (5OAK), followed by Rhino at 250 coins, Zebra at 125 coins and Gazelle at 75 coins. All card symbols, eg. Hearts, Clubs, diamonds and spades and the gem stone all pay between 60 and 40 coins for a 5OAK. Wilds substitute for all symbols except for the Elephant Prize disk and they appear on reels 2, 3 and 4 only. The good news is that they can often be stacked, creating more winning opportunities. An interesting adaptation to Elephant King slot is the prize slider that sits above the reels, reminiscent of NetEnt’s EggOMatic. This slider has a mixture of fixed cash wins (based on the level of your bet amount) and Free Spins rewards. Should you land the Elephant Prize disk feature on either reel 1, 3 or 5 only then you will be instantly rewarded with the prize directly above the reel in the slider. During spins the slider moves one place left continuously during your playing session. You will know if you have landed a Prize Disk as the game will start shaking as if a herd of elephants are running through your device - a nice touch. 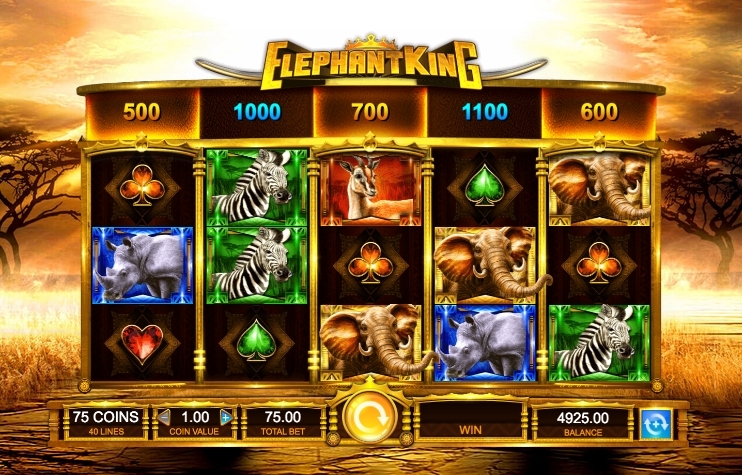 Triggering the free spins feature in Elephant King requires simultaneously landing one or more of the Elephant Prize Disks on reels 1, 3 or 5 with the Free Spins label appearing in the slider above the reel. You will get 10 free spins for each prize disk, so there is potentially 30 free spins up for grabs here. There is also extra free spins rewarded during the feature every time the Extra Spins symbol appears, rewarding an additional 2 free spins per appearance. During the free spins feature there is additional Elephant King scatters added to the reels, giving more chances of winning either cash prizes and free spins. Should any of the other animals appear then they will become 2x multiplier symbols, making more winning possibilities.